Extensible Enclosures for PLC Panel has 100% modularity to more pre-engineering at customer end. Depth-adjustable mounting of component plate and transformer / choke channels on a 25mm pitch. Which rests on member of frame structure and thus load is transferred to base. Mounting nut bolts are used only to hold it vertically. It is also used for Drive Panels, Motor Starter Panels, APFC Panels And Transformer Panels. 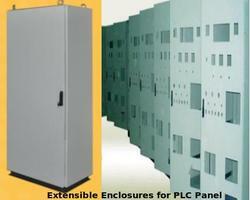 Looking for Extensible Enclosures for PLC Panel ?